Netberg Aeon J224 M3 JBOD is a cost-effective solution for all-flash HA cluster or server primary storage expansion. 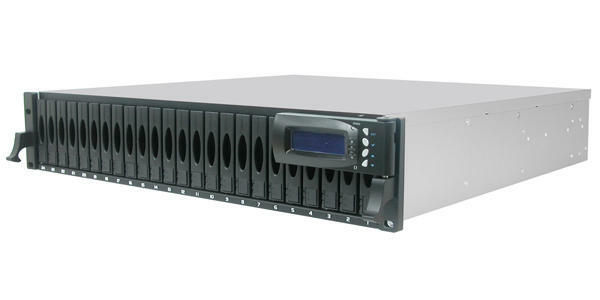 24 hot-swap 2.5″ 12G SAS HDD trays and high-availability design meet the 2U height, short depth and reasonable cost. Pure flash or hybrid configurations with the mix of solid-state and SAS media – you are free to create the right storage solution for your needs. Netberg Aeon J424 M3 JBOD can deliver up to 14.4 GB/s of bandwidth to hosts over three external multi-lane SAS 12G ports. Such performance is important for applications like video post-production, direct-attach storage for HPC, cloud storage, VDI applications, traditional database and NoSQL DB. High availability and performance of Netberg Aeon J224 M3 are a perfect match to demanding business applications requirements. Compact 2U enclosure and 24 2.5" trays are ideal for all-flash and hybrid deployments. Beside 24 front-accessible trays, Aeon J224 M3 can daisy-chain up to 6 more JBODs for total 144 solid-state drives (SSD). Total redundancy is backed by drive hot-swap, redundant hot-swappable power, cooling and dual SAS interface modules (SIM). Notification LEDs help to localize problem in seconds. When combined with Windows Storage Spaces, HA Linux or LSI Syncro CS solution, Aeon J224 M3 is an excellent base for continuous-availability cluster solution. HA for application cluster, virtualization, storage services became affordable for SMB companies. While only three direct-attached servers are possible with Aeon J224 M3, SAS switches extend it to scale-out SAS SAN with hundreds of nodes.